Piano Refinishing in Matt, Satin or Gloss finishes. The photo's below are showing a Standard & Grainfilled sprayed Satin Piano finish. This finish generally takes 1 to 2 weeks from start to completion, this is the most commonly requested finish amongst piano dealers. You can have this finish in Various colours and in a Matt, Satin or 90% Gloss sheen level. Various colours, Matt, Satin & Gloss sheens available. Note: All Names where needed are replaced with Vinyl Transfers and lacquered over. Click on one of the images below to go to our Portfolio pages for more photo's of these piano finishes. Chappell Baby Grand Piano in a Satin Finish. Bechstein Model B Grand Piano repolished in a Rosewood satin finish. 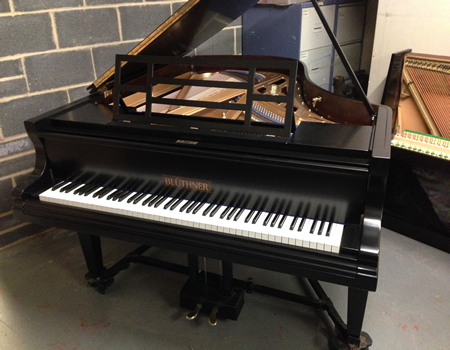 Bluthner Grand Piano in a Black satin Finish. 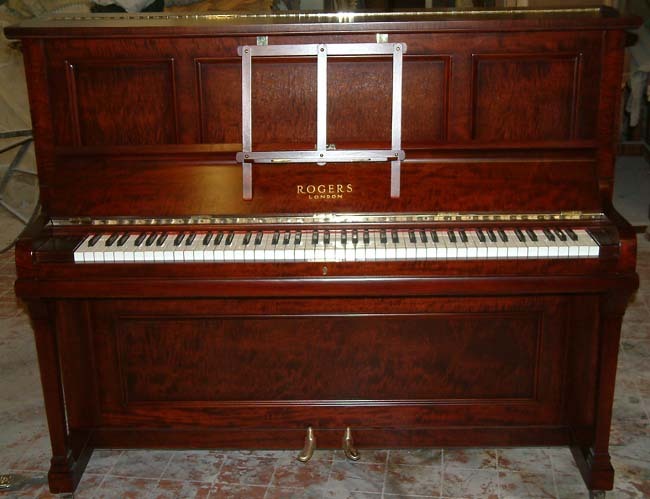 Rogers Repolished Upright Piano in a Satin Finish.